More and more news organisations are implementing paywalls, as legacy revenues continue to erode and digital advertising increasingly go to large technology companies. 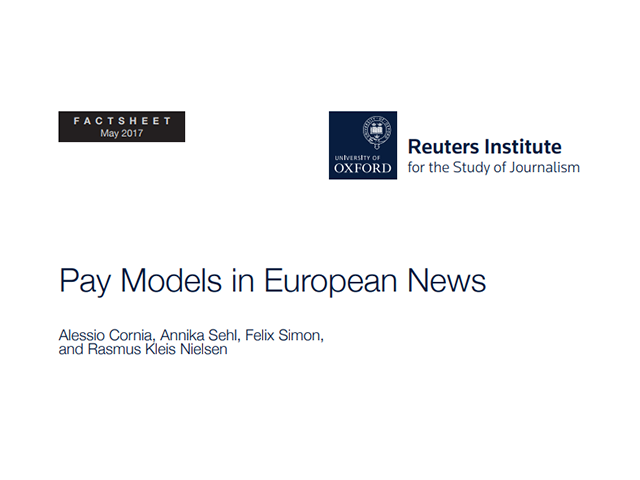 In this factsheet, we present an overview of the diffusion of different forms of pay models across a sample of 171 of the most important news organisations in six European countries (Finland, France, Germany, Italy, Poland, and the UK). Results show that different types of news organisations adopt diverse approaches. A clear majority of newspapers and weeklies operate a pay model (freemium, metered paywalls, hard paywalls), whereas all broadcasters and almost all digital-born sites offer free access to their news. Pay models adoption is widespread especially in Finland, France, and Poland, where from 87% to 95% of newspapers and weeklies have adopted paywalls. By contrast, in Italy, Germany and the UK, many of the most important news outlets continue to offer free access to their digital content.